Ross Redman believes Glentoran can step up to the challenge when they face Crusaders at Seaview in the fifth round of the Tennent's Irish Cup. The Oval defender was honest enough to admit after yesterday's draw that a trip to the home of the champions on January 5 was just about the last tie the Glens wanted, but he insists the east Belfast team will be motivated to enjoy a long cup run for the fans. When the Crues and the Glens came out side by side there were gasps all around the Pat Jennings suite at Windsor Park. It's a pairing fit for the final. Also on the minds of those assembled was Saturday's controversial 2-2 draw between the sides. In that Oval encounter, Latvia referee Andris Treimanis, in charge as part of the IFA exchange scheme, had a shocker and was heavily criticised by respective bosses Ronnie McFall and Stephen Baxter. Crues defender Kyle Owens had been dismissed before a mass brawl erupted involving both sets of players and some members of staff from each team, leading to red cards for Seaview ace Rory Patterson and Glentoran's John McGuigan. IFA sources confirmed that a local whistler will take charge of the cup tie. "It was a strange game and, to be honest, I don't think it was a nasty game," said Glens ace Redman, reflecting on the weekend. "Obviously there was one big moment, and it has been well documented about the referee, but the quality of football was actually quite good." On the cup draw, Redman said: "It's not the draw we wanted. From I've been with Glentoran we have always had tough draws in the Irish Cup, but to win the trophy you have to beat these teams. "We had the big game last Saturday against Crusaders and we will have another league match with them just before the cup tie so we will know each other well. "We would have liked to play Crusaders later in the competition but that's the way it has worked out and we'll look forward to going to Seaview. I'm sure there will be a big crowd and it is a big game for us to step up against the champions. "The league is our main priority, and we want to start getting a run of results together to push into the top six, but we'd love a run in the cup, especially for the fans. It would be great to reach the final for them." 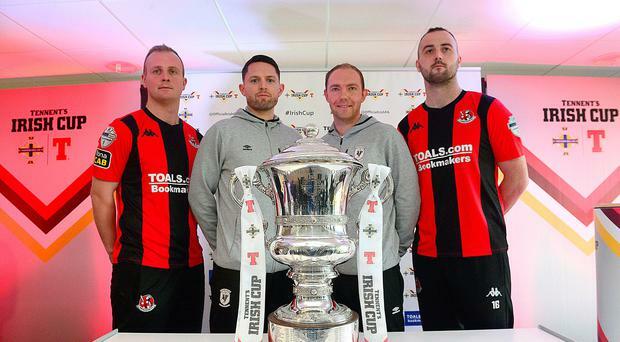 Crusaders, who last night signed 37-year-old goalkeeper Gerard Doherty from Derry City, may have won three league titles in the last four seasons but they haven't savoured Irish Cup glory since 2009 and are keen to put that right. Two other all-Premiership ties see last season's runners-up Cliftonville hosting Dungannon Swifts and Warrenpoint travelling to Institute. Town manager Stephen McDonnell said: "It'll be a good game of football between ourselves and Institute because we both like to get the ball down and play. It will also be on a good surface which always helps." Holders Coleraine entertain H&W Welders, with Bannsiders boss Rodney McAree saying: "It's a home draw which is pleasing. It's a game that we will be expected to win and if we are at our very best I expect that as well, but we'll have to be because H&W Welders will be tough opponents." In an intriguing set of games between top flight and tier two clubs, Linfield will entertain Ballyclare Comrades, Dundela face Premiership leaders Ballymena United at Wilgar Park, Ards play Carrick and Newry City will go to runaway Championship leaders Larne, who reached the final four last season. There is a cracking tie for Greyabbey-based junior club Rosemount Rec with the Northern Amateur Football League outfit meeting Glenavon at Mourneview Park. Last season's surprise semi-finalists Loughgall will play Crumlin Star at Lakeview Park.